Taka likes to watch documentaries. I know it's probably not your typical "thing" but he loves them. Especially "The Universe" series. However his new favorite is "The Life of Mammals". This is a 9 episode series hosted by naturalist David Attenborough and is an in-depth examination of mammals. It's actually super interesting and you learn a lot about species and animals that perhaps you've never heard of. We are now using http://www.awf.org/content/wildlife/detail/pangolin and a few other things to start a pangolin unit study. Anyway, this is a great series (appropriate for all ages) and I would encourage everyone to check it out. It's currently available on Netflix Instant Watch or check your local library. but now they look like this! Taka has always been a sensitive little guy but working with the seeds, watching them grow from tiny sprouts has increased his understanding of being gentle, patience and caring from something that is completely dependent on you. Not to mention this has also been a great scientific learning experience. -The cats liked the mint more than they liked the catnip! 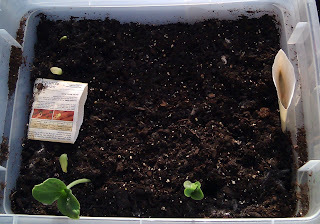 The catnip sprouts are still alive and kicking. The mint sprouts - not so much. -Sprouts don't grow 3 inches overnight. 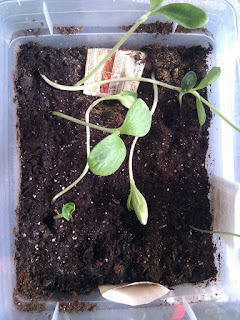 Although he has noticed that the more sun they get the quicker they seem to grow. Yesterday we worked in the garden to remove the weeds that have sprouted since winter, turn the soil to make it nice and soft for our sprouts and get it ready to add our compost before tilling again. I was pleasantly surprised as he worked the garden with me for an hour or so, without complaint and with a happy heart. I guess it's true what they say, gardening is good for the soul :) I hope you'll try it! Today we worked with money. This included sorting coins (quarters, dimes, nickels, pennies), counting (lots of counting...), and identifying different types of money (US, Canadian, Brazilian, etc). While we were sorting Taka noticed that there were differences in the coins. 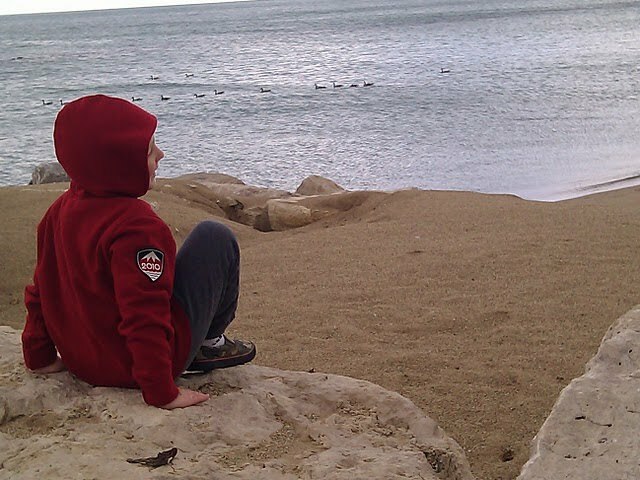 He found wheat pennies, commemorative nickels and various state quarters. We thought it would be cool to see if he could find quarters from every state. In order to make it more of a game I threw together this little "Bingo" chart. Each square has the state name, capital and flag. 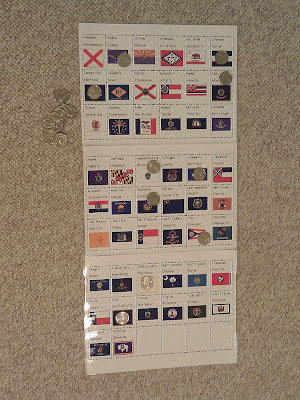 We printed it out, laminated it and have been using glue dots to adhere the quarters to the appropriate square. He really enjoys using the glue dots and finding new coins to match the squares on the chart. When he's done he'll have "Bingo" and will "Win" the game. You can find the document HERE or in the attachment below. Taka loves to do this work regardless of the weather outside. We've separated the cards into dessert cups and leave the cups and weather chart on the tray. Since it's on a tray we don't use velcro stickers on the back of the cards. This is a very nice work that the kiddo's are sure to enjoy. 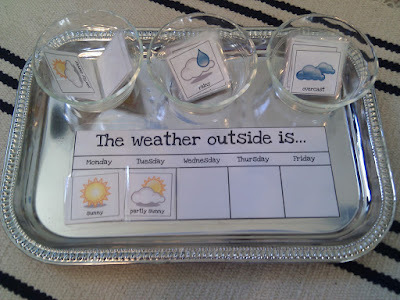 Simply print out the chart and weather cards listed on Homeschool Creations under Weekly Weather Graph, cut them out, laminate, cut again :) and Viola! 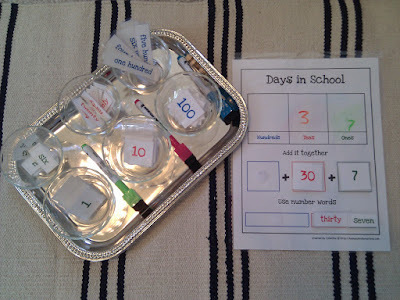 To find the print out and take a look at the way Homeschool Creations has implemented "Days in School" just click "Days in School" and you will be directed to their blog. Scroll down and you will find the link for the print out. 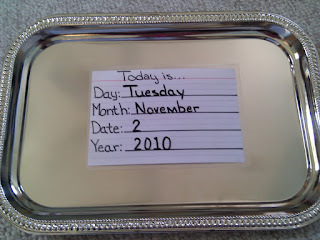 Although I LOVE the Morning Board idea, we just weren't able to create it exactly the same way as other moms. I adapted our version from Homeschool Creations & Carisa at 1+1+1=1. Good luck to you in creating your own version! Every day Taka begins his day with "Morning Board" type works. One of these is the "Today is..." card. I took a 4"x6" index card and wrote out Today Is..., Day:, Month:, Date:, Year:. Then I laminated the index card and Viola! We now have an easy to erase card that Taka' can use every day. 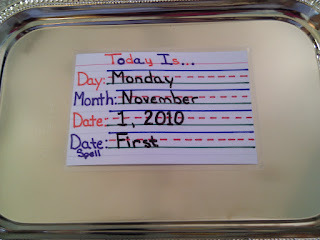 This was our first version of the "Today Is" card. I kept it pretty straight forward and this has worked for a couple of months. However Taka asked that I make it more like his writing paper. Green grass bottom line, red fence middle line and blue sky top line. I whipped one up for him in a matter of minutes and he is now excited and happy to write on his new card. The new version may actually work better for very small children. You could even draw a little picture at the beginning of each line. A cloud at the top line, a fence by the middle line and a bit of grass at the bottom line. It helped Taka and a few of his friends when they were just beginning to learn to write. The "grass" and "sky" seems to help the child define the space for the letters.